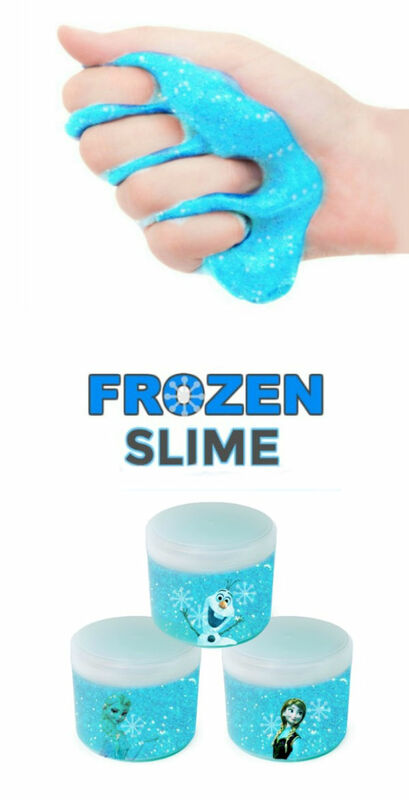 My kids love the Frozen Disney movie, and they also love slime. 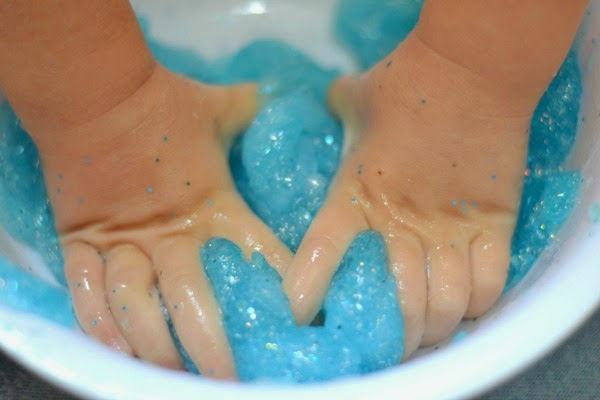 Today, I combined the two with this super fun play recipe for kids! 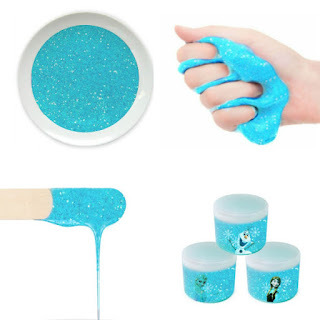 What could be more fun than super sparkly, ultra cold slime? For my two slime fanatics not too much! This recipe is really easy and can be made icy-cold and even FROZEN. 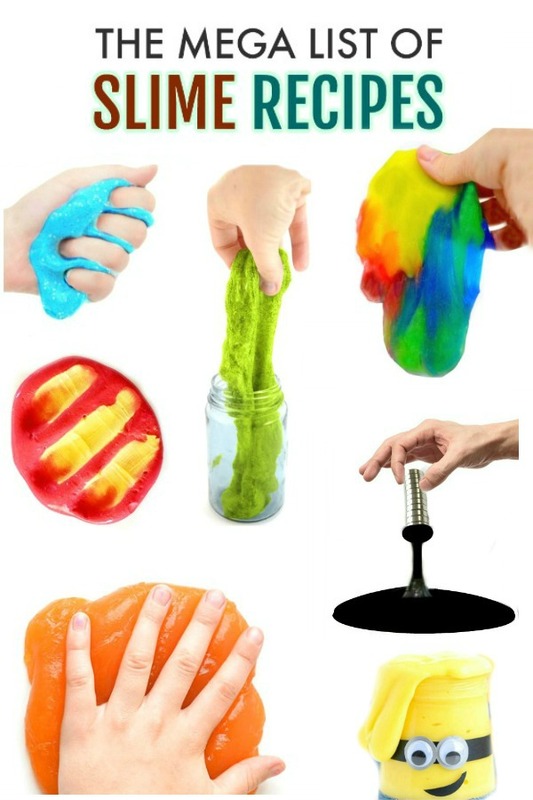 Read on to see how we experimented with the temperature of our slime to achieve amazing results. 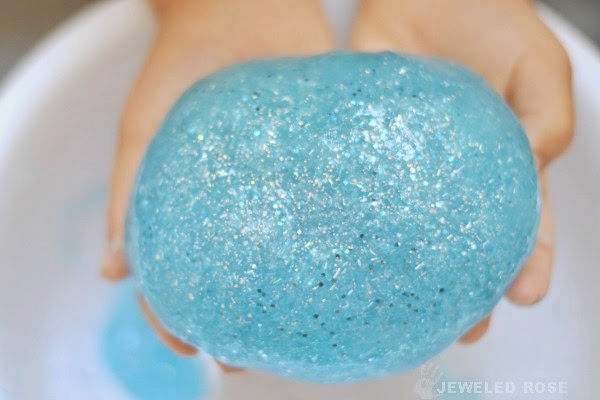 Note: We added iridescent glitter to our slime to make it extra sparkly! We also added light blue glitter. 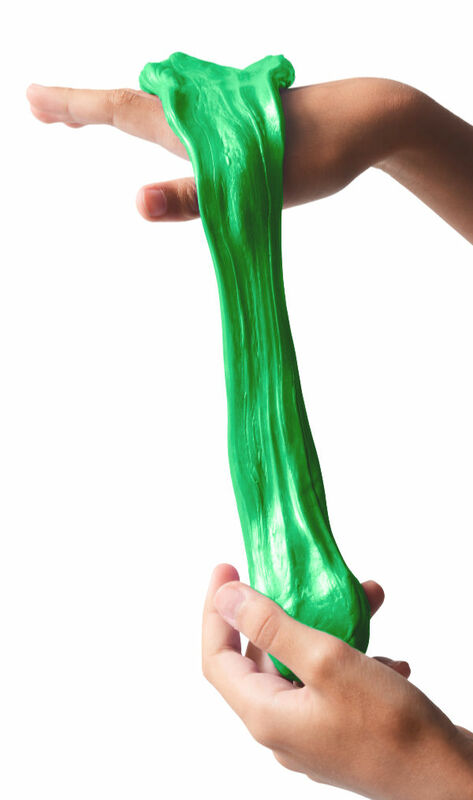 To make your slime icy-cold place the glue and liquid starch in the refrigerator for a few hours before you begin. Begin by pouring the glue into a large bowl. 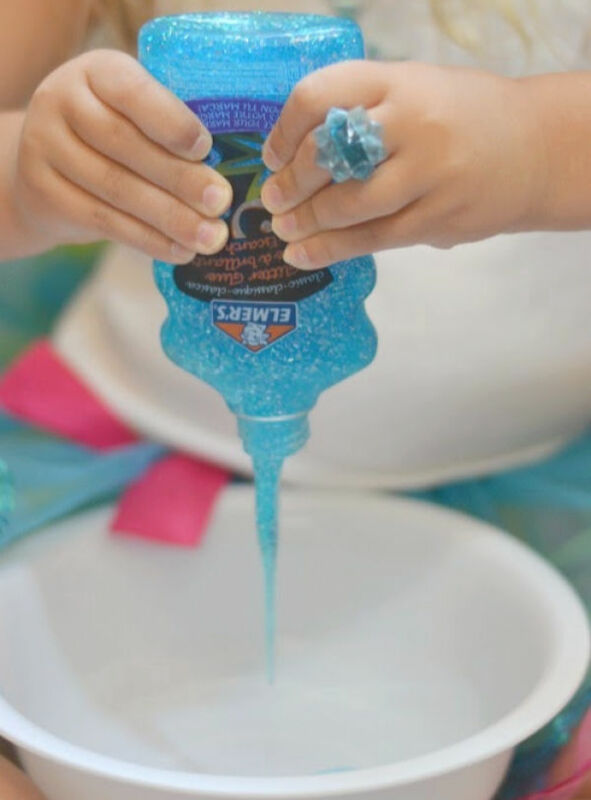 We used two bottles of blue glitter glue, and that gave us the needed 1 cup of glue. Have kids slowly add liquid starch to the bowl and mix, slowly adding more starch and mixing until the desired consistency is reached. 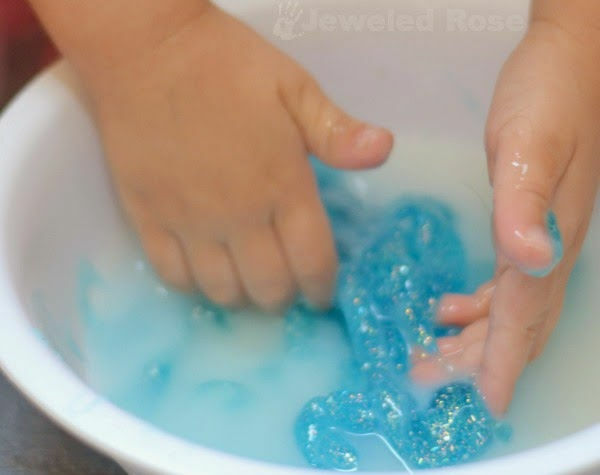 After a bit of kneading you will have super sparkly, Frozen slime! Having trouble? See our tips below! Refrigerating the ingredients before making the slime made it super cold and icy! Rosie and Jewel loved the added sensory element, and it really helped to capture the Frozen movie theme. 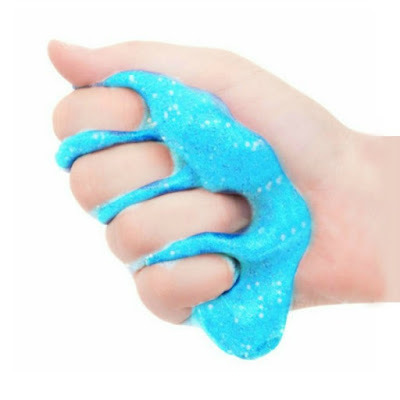 The slime felt so icy cold that both girls simply loved holding it and feeling it OOZE between their fingers. Even though it was icy-cold we could still stretch it, pull it, and even see through it! After a bit of free play we added Frozen action figures, and my girls found all sorts of ways to explore! 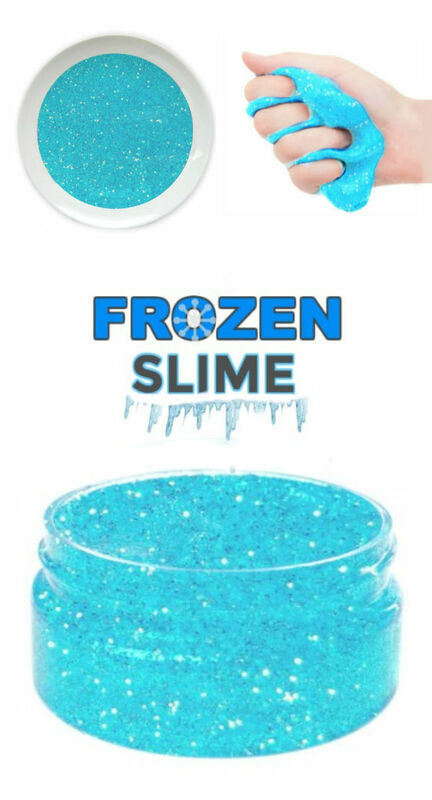 After a few days we experimented with our slime and tried freezing it for an hour before play. We placed the slime on a plate in the freezer. An hour later we were amazed! The slime was frozen on the outside, but the inside was still OOZE! As we handled the slime it melted and mixed in magical ways! It literally felt like we put ice cubes in our slime! SO COOL"! 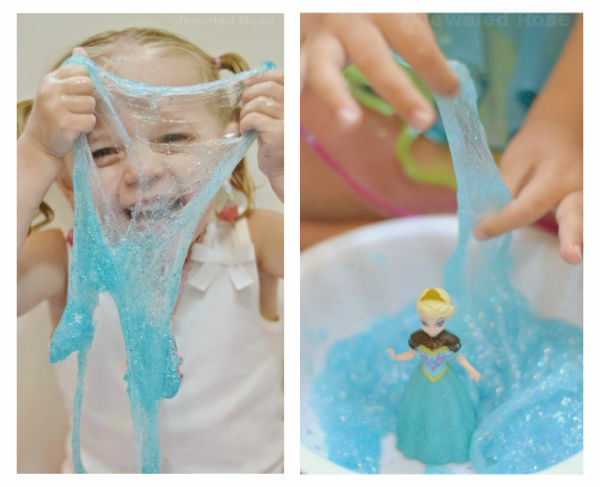 My entire family has had so much fun with this easy to make, frozen slime! 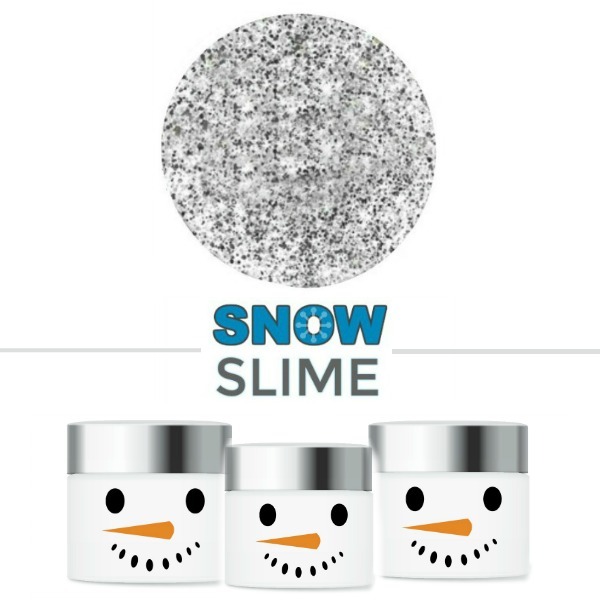 This slime would make a great party favor for a winter party or a Frozen themed birthday party! All you need are containers like these. 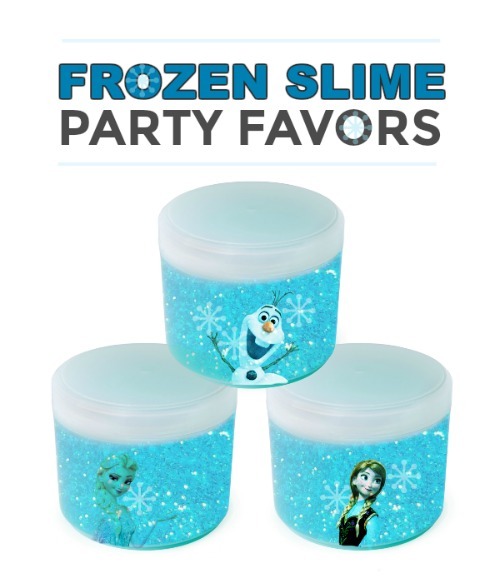 Fill them with frozen slime, and you are all set with a party favor to please! 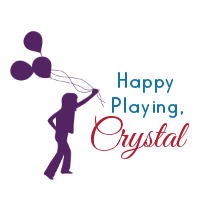 Embellish your party favors with Frozen stickers if desired. Liquid starch can be hard to find in stores. We get ours online here. 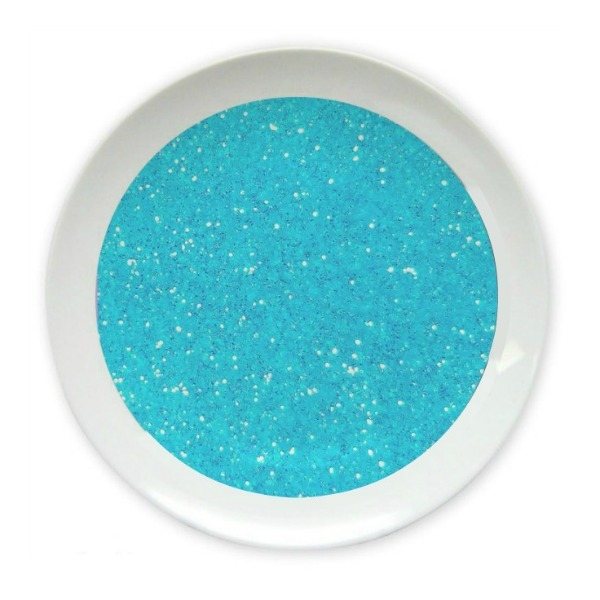 The blue glitter glue that we used for this recipe can be found here, and the containers that we used to make the party favors were purchased on Amazon here.